FaceSentry 5AN is a revolutionary smart identity management appliance that offers entry via biometric face identification, contactless smart card, staff ID, or QR-code. The QR-code upgrade allows you to share an eKey with guests while you’re away from your Office and monitor all activity via the web administration tool. 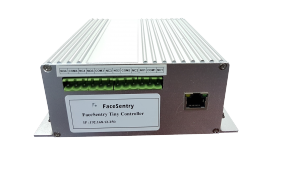 Powered by standard PoE (Power over Ethernet), FaceSEntry 5AN can be installed in minutes with only 6 screws. FaceSentry 5AN is a true enterprise grade access control or time-and-attendance appliance. High-performance ARM Cortex A17 Quad-Core CPU with Embedded Linux in the panel to provide speedy and reliable facial recognition. Panel powered by PoE for easier and more flexible installation. The panel requires only one standard Cat-5 cable with RJ-45 to provide data connection and power. Micro Controller come in smaller footprint enclosure and lower price tag, but door relay (dry contact) is still standard feature. Improved LED illumination panel to enhance image quality further. Improved 5″ multi-touch panel with better clarity and easier for user interaction. There is no user sensitive information inside the storage of FaceSentry panel. The user profile is stored in Controller Box, which is behind the wall. All the data and door-opening relay block connectors of FaceSentry are stored in a strong metallic controller box inside the premise (it will be even better in separate secured ELV closet) for impeccable security. User profile is retrieved only when verification is needed and after smart card/ID/QR-code was received by the panel. All connections are AES encrypted. Most of the All-In-One low-cost face recognition access control device has only one camera. Depends on installation position, most of the male users have to bow to the device every time. Most of the users of FaceSentry, if his/her height is between 1.55 to 1.88m, can be verified in an arm’s length from the device without bowing. Thanks for the portrait oriented dual cameras for exceptional wide coverage of the cardholders. FaceSentry 5AN is, therefore, easier to use, and less prone to misoperation during bowing. The competition has very limited choice of input/output connections. FaceSentry 5AN have Wiegand Input (only in Standard Controller), Wiegand Output, 2 groups of relay blocks with full programmability, and GPIO ports. We have the experience to use these connectors to link with customer’s existing security peripherals in a creative way. Cognitec FaceVACS has been leading the face recognition industry since 2002, and the speed, accuracy, and robustness of algorithm against various kind of variance are unseen among the competitions. Cognitec is the most trusted brand by Immigration, Airport, Border Control and Law Enforcement agencies across the globe. Most of the All-In-One low-cost face recognition access control device is single-processing. Data synchronization is not possible during the day because of verification process preempts all the processing power of the device. Data synchronization, such as new staff, staff information change, deletion of staff, can be done while the verification task is paused completely. FaceSentry 5AN is a true multi-processing device: data synchronization is non-stop while face recognition is taking place. The foreground verification does not preempt the background task of data synchronization. This is particularly important for the enterprise-scale network of the device with huge traffic and large-volume data modification. Most of the All-In-One low-cost face recognition access control device is a rather simple device with very limited, if not none, potential to be customized. FaceSentry 5AN is backed up with a team professional developers that can customize the firmware to cope with unique requirements/workflow of the customers. Some of the All-In-One low-cost face recognition access control device is reported to have 50% failure rate after one year of non-operation. Site-proven data synchronization mechanism to link up hundreds of FaceSentry appliances to form a huge network. FaceSentry can be configured as “Master” or “Slave” mode. “Master” is the mastermind of a FaceSentry network that responsible for management of enrollment records of the system, monitoring the health of all slaves, pull transaction logs from all operating slaves, and storage of transaction logs, centralized system configuration management, and mass firmware upgrade distribution. “Master” can be any FaceSentry 5AN appliances for a small network or a Window PC servers that run FSMaster Server software (sold separately) that can support hundreds of slave appliances. “Slave” appliance can only be FaceSentry 5AN that provides facial biometric operation, such as 1:1 verification, 1:N identification, and face enrolment, and to store enrollment record (facial template, staff ID, card number, access group privileges, etc.) and be ready for biometric operation, especially when “Master” appliance or the “Slave” itself is offline. Enrollment can be done at FaceSentry device at HR or Security Department, and template of a new enrollee shall be synchronized to all slaves under the coordination of Master device. All transaction logs are centrally stored in one place at Master appliance or FSMaster for easy viewing and reporting. The administrator does not need to search for transaction logs from hundreds of slave appliances one by one. All data synchronization between Master and Slave is done automatically behind the scene with very minimal, if not none, intervention by the Administrator. ** Accuracy depends on actual threshold setting and lighting condition. Like any biometrics, face recognition & liveliness detection intrinsically cannot provide 100% recognition accuracy. The remaining uncertainty has to be considered by the customer and can be operationally covered to a certain degree. Our first generation of face recognition access control appliance, named FaceVACS-Sentry, was first launched in 2005. It was a real breakthrough back then. A true turnkey solution to provide face recognition access control out of the box was unseen before the launch of FaceVACS-Sentry. FaceVACS-Sentinel replaced FaceVACS-Sentry in 2008 to provide 1:N identification on top of 1:1 verification, and provide compensation lighting to make the device easier to deploy and provide better recognition accuracy. For many years, FaceVACS-Sentinel is still the top choice of clients who place security, reliability, scalability, and manageability in the first place. A long impressive list of users from Airports, Bank Data Centres, Real Estate, and Gambling Management industry is a testimonial of the outstanding value and reliability of Sentry device. The device is now re-branded as FaceSentry™ to mark our relentless pursuit for the excellent quality of face recognition appliance produced by IWT to enter another new stage. We build FaceSentry around the world’s leading face recognition algorithm FaceVACS® from Cognitec. A list of new features were introduced to maximize the accuracy and reliability of the system, such as fully embedded Linux system with web service, full TCP/IP stack, comprehensive Wiegand protocol support, Master-Slave data synchronization algorithm to achieve one simple aim: manageable security with connectivity & scalability. A re-designed front panel, powered by ARM Cortex A17 Quad-Core CPU, a true self-sustained embedded platform, to provide robust & high-quality image capture that leads to better recognition accuracy. Besides, as front panel connects to Recognition Controller via standard Ethernet, the location of Controller will not longer be limited to the vicinity of the front panel, but far away dedicated ELV room for better security. Portrait camera and 5” HD LCD provides ultra-wide coverage of different heights of users. The front panel device supports rich media display and Unicode characters display, besides it is a touch screen, developers have more possibility to build the sophisticated application before or after the user authentication.